Since the Willis Pipe Organ Organ appeal started in 2006 we have had a website and later in 2009 when it became clear we needed to have online reports of our fundraising events we started a separate blog (the website was an older design which was created before blogs became mainstream). So we’ve operated for several years with two websites for the organ appeal, which is not ideal. 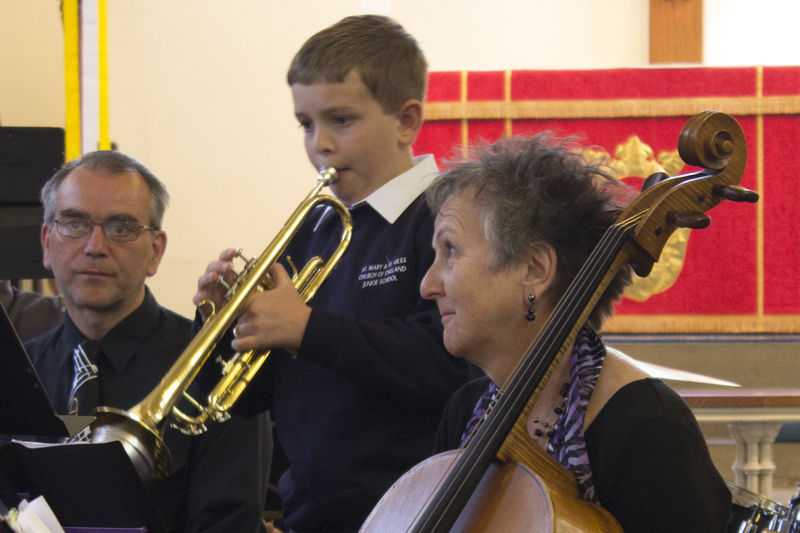 We are in the process of transferring over all the information from the organ appeal website to the new music for all website, amending URLs in blog posts and redirecting web traffic to the new site, so eventually both the old site and the old blog will be closed down. The blog posts are already on the new site, plus a lot of information about events. Please visit our new Music for all @ SMSG website and continue to support our historic Willis pipe organ and musical activities at St Mary and St Giles Church. The sunny summer weather was perfect for two early evening concerts in the StonyLive! Programme in SMSG Church. 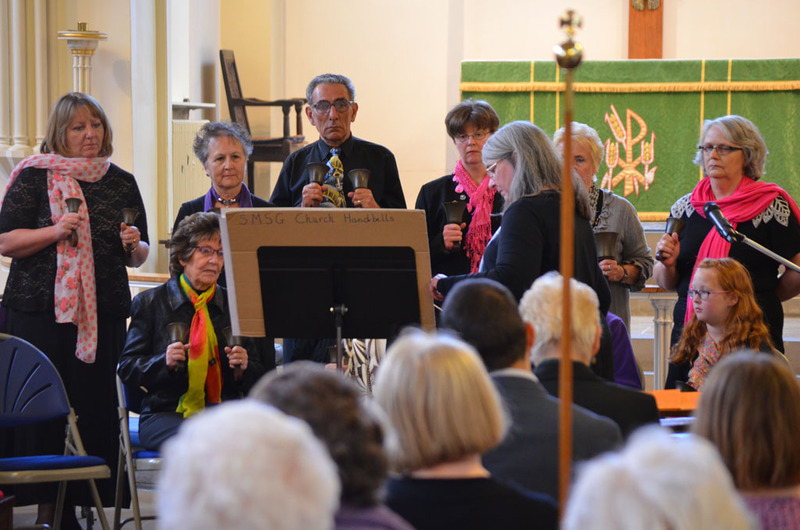 At 6.30pm on Wednesday 10th June our Church Handbell Ringers gathered to ring a selection of their favourite tunes and to show the versatility of the the handbells (and their ringers!). They ranged from the hymn, ‘How great thou art’ to the energetic ‘Can Can’ and from the calypso-style ‘Mango Walk’ to the poignant ‘Largo’ from Dvorak’s New World Symphony. 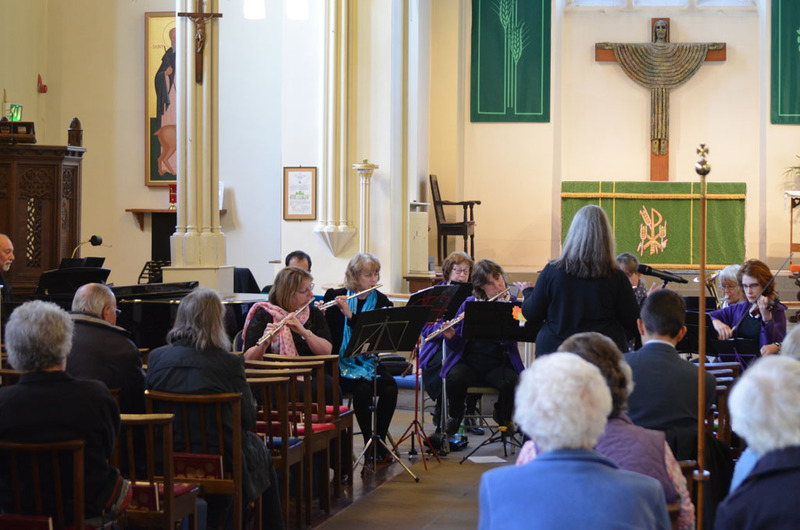 The audience hummed along and were very supportive, many staying to enjoy some refreshments and the SMSG Church Band concert which followed at 7.30pm. 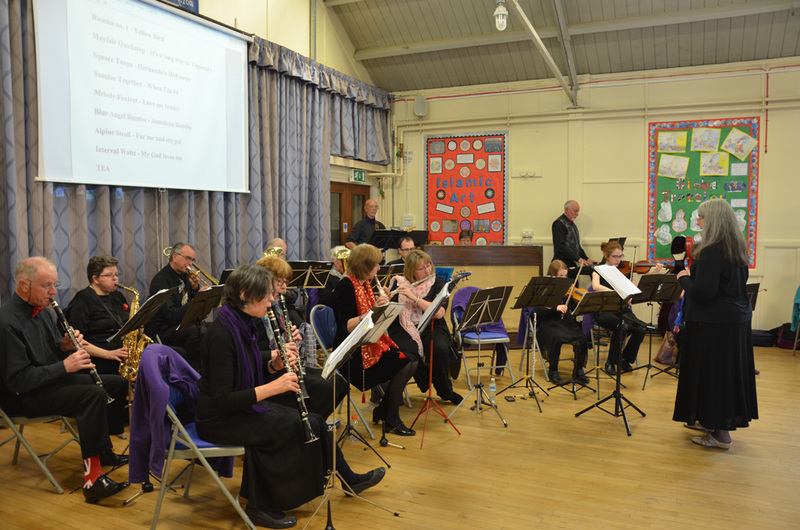 The Band concert’s theme was songs from the 1940s and encouraged audience participation – we were not disappointed – there was excellent singing! Beginning with ‘Colonel Bogey March’ we enjoyed a ‘Sentimental Journey’ by packing up our troubles in our old kit bag and taking the Chattanooga Choo Choo to Berkeley Square. 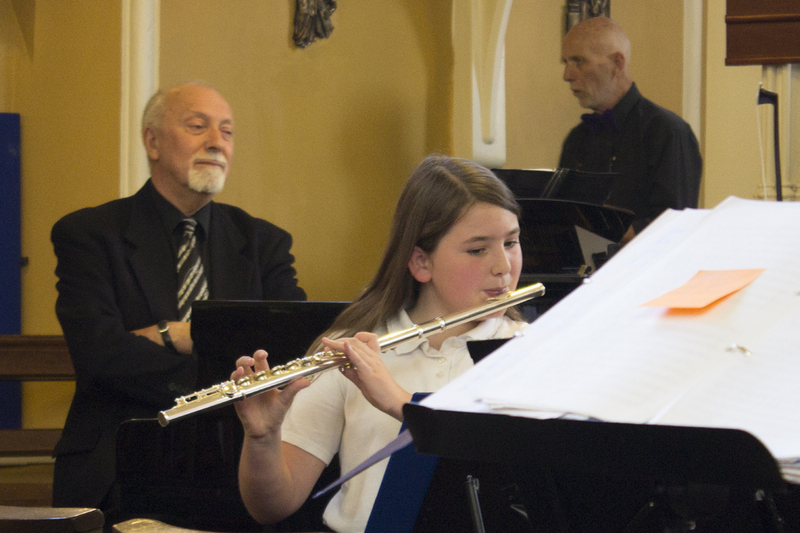 Television and film tunes were interspersed with a lovely flute and piano duet by Alison and Dave, playing the favourite ‘Danny Boy’ and Anna, Fiona and Sally treated us to two short flute trios. The evening was rounded off with ‘The Dam Busters’ by Eric Coates. 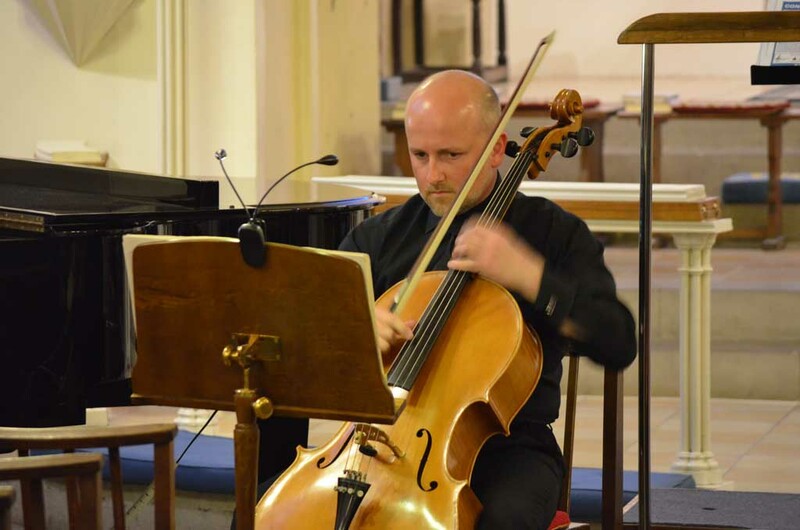 Many thanks to all who rang and played and served refreshments and to the lovely audience whose donations of £75.58 will go towards a disabled access at the west door of our church. Glorious warm sunshine welcomed many people to Stony Stratford on Sunday 7th June – several events took place that day (the Classic Car rally in Market Square, the Big lunch with the Dakota flypast) and we timed Cream Teas and concert to coincide with both to pick up those who had attended either event and wanted some more refreshment as they made they way around the cars and watched the flypast. 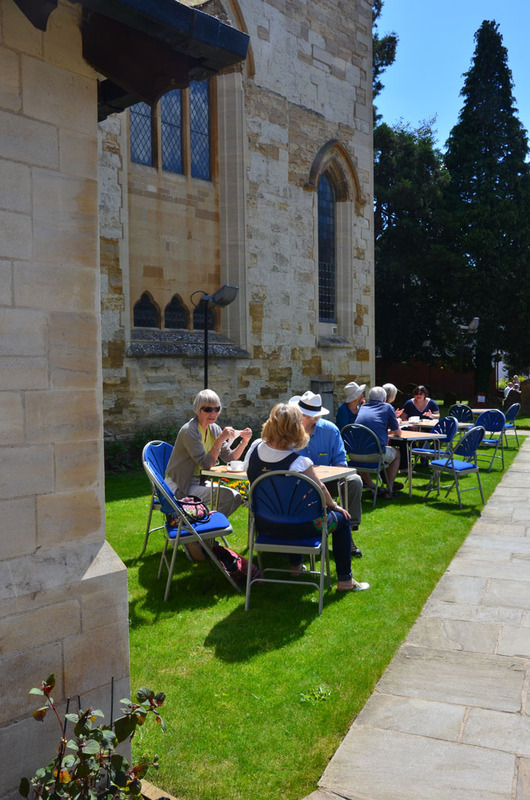 As the weather was so good we had tables and chairs on the church lawn alongside the parish hall and a steady steam of people throughout the afternoon were served by Fiona, Nina, Anna, Margaret, Dai, Lesley, Sue and Dave, while the Millbrook ensemble tested the acoustic during their rehearsal in the church before they joined everyone in the hall for Cream Teas. 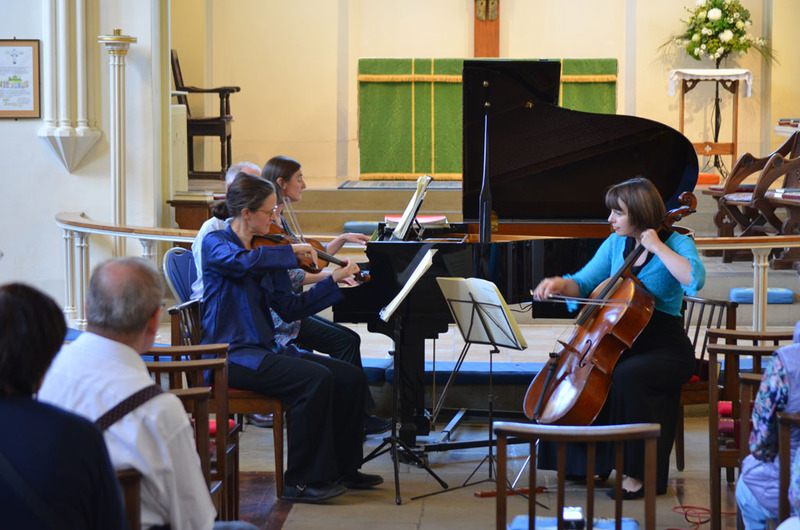 Three of the four members of the Millbrook Ensemble played for us: Charlotte Brennand on Piano, Louise Fuller on Violin and Rosalind Gladstone on Cello. 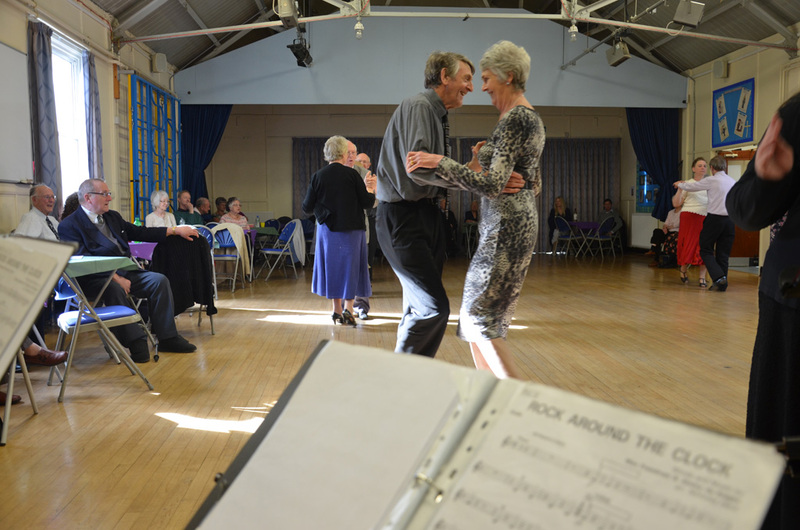 We raised a total of £489.30 from this combined event for the organ casework. 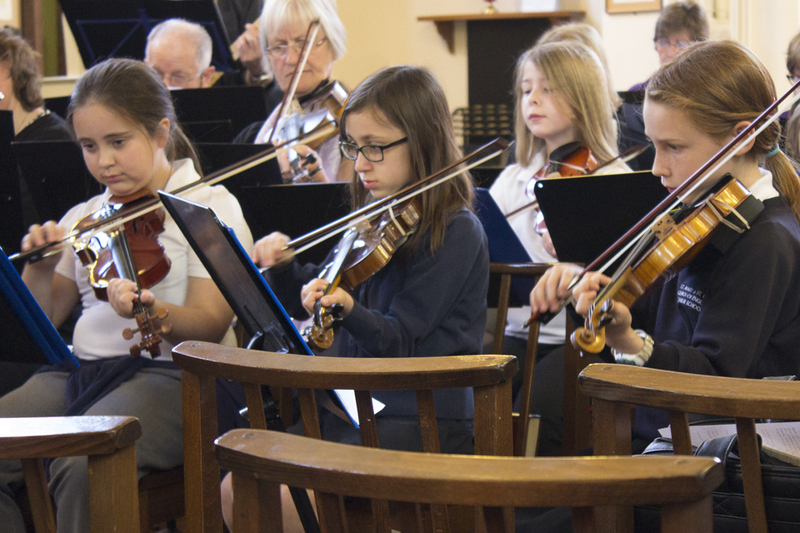 Thank you to everyone who baked the multitude of scones, helped set up, serve refreshments and tidied up afterwards and a big special thank you to Louise, Charlotte and Rosalind for their wonderful music, which was the second event at the church as part of the annual StonyLive festival. 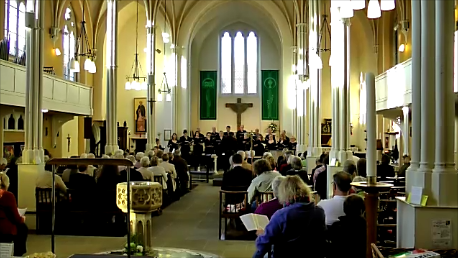 The well-known local choir Polymnia gave a warm and heartfelt concert entitled Summer Delights on Saturday evening (6th June) in St Mary & St Giles Church. 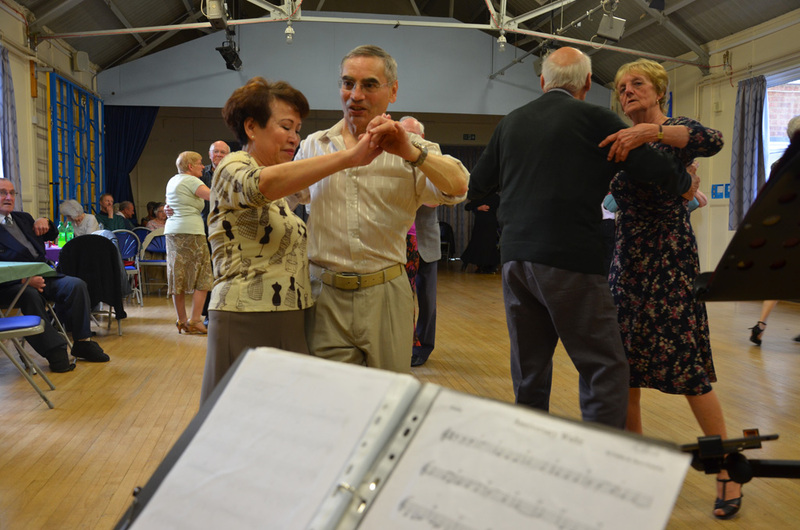 Their Director is John Byron and accompanist Anna Le Hair. 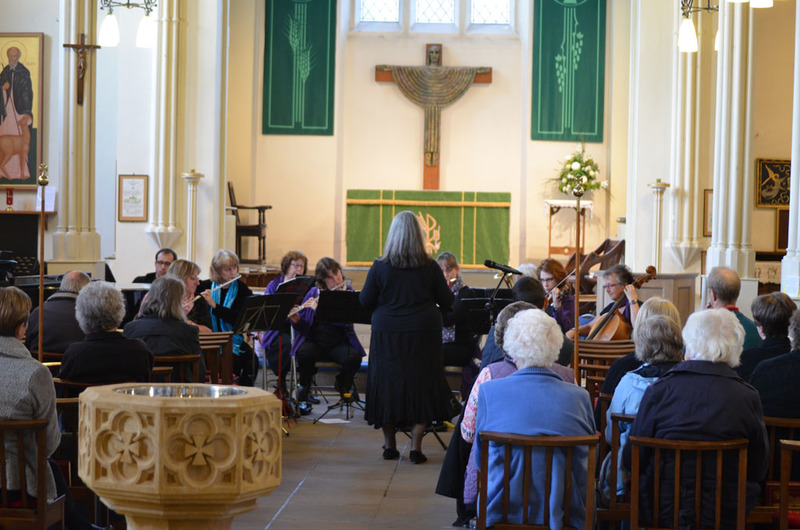 The choir sang from the Chancel for the concert – except for The Seagull which was the first item after the interval. 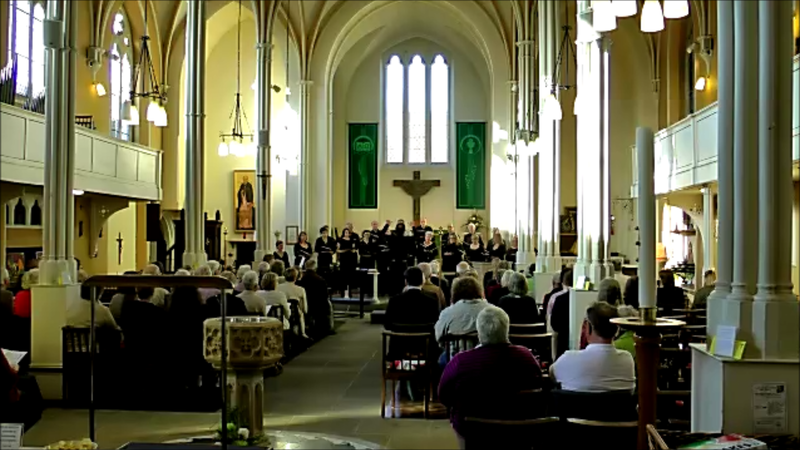 The choir stood in the side aisles to surround the audience and sang this item which is based on a Skye folk song. One could hear the seagulls! Our favourite was The Blue Bird – ‘heavenly’ said Shirley. I was invited by Polymnia to be a page turner for Anna. I’ve never been a page turner before and I hope I turned in time and only one page at a time! But I’d say the page turner has the best seat in the concert: sitting right in front of the choir and next to the piano one feels almost part of the music. I look forward to being asked again! I thank Marian, Shirley, Dai and Nina for setting up our Church, welcoming audience, serving refreshments and returning the Church ready for Sunday Mass – also to Lesley for making shortbread. Polymnia kindly offered £100 for the use of the Church and together with donations for an interval glass of wine the Organ Restoration Fund has benefited by exactly £200. 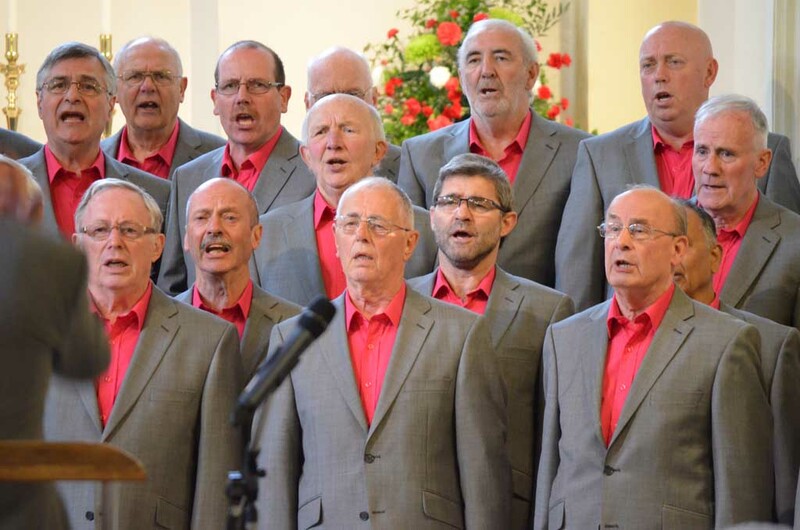 The Northampton Male Voice Choir gave a warm and heartfelt concert on Saturday evening (30th May) in St Mary & St Giles Church, with guest performers James Jarvis (cello) and Helen Rouse (piano) giving the men’s voices a break with their duets in both the first and second half of the concert. The church was filled with the sound of nearly 40 male voices in beautiful harmony. 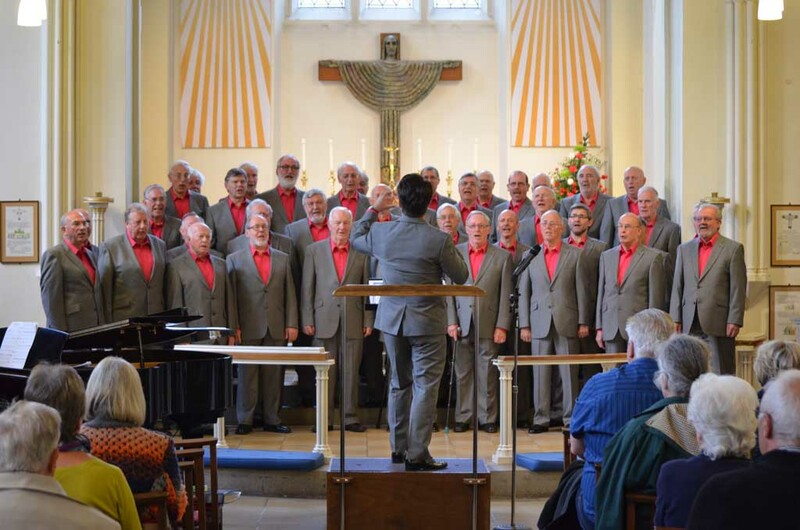 As Stephen Bell, their Musical Director explained to the audience the choir is award winning – it recently won its class in both the Oundle and the Northampton Male Voice choir festivals. 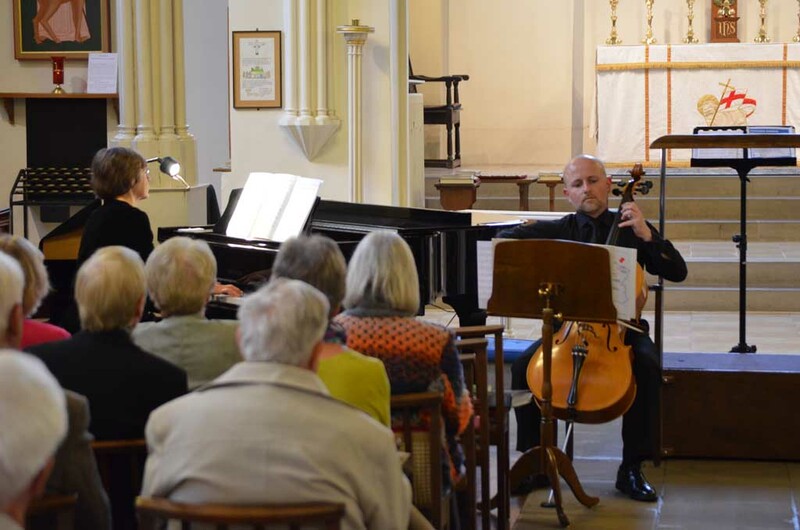 The cello and piano duets were performed beautifully by James and Helen. 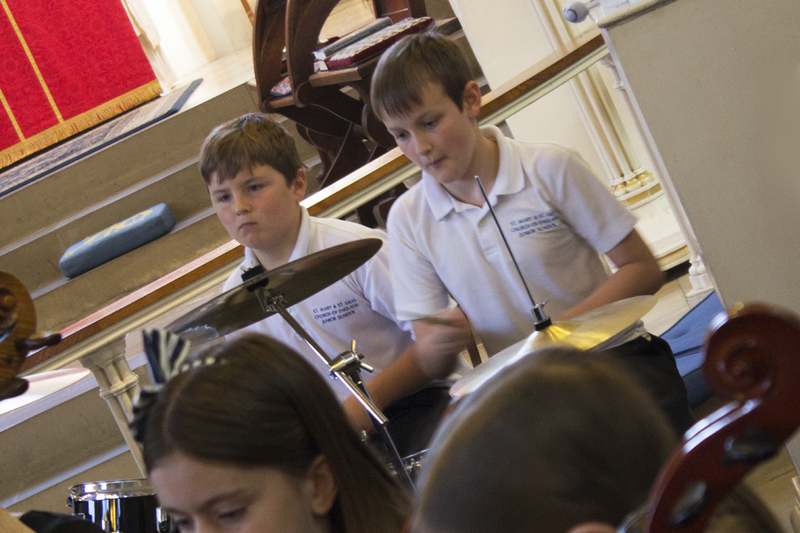 I would like to thank all the Music for all @ SMSG front of house team, Stephen Bell and the choir and accompanist, and James and Helen for their wonderful performances. 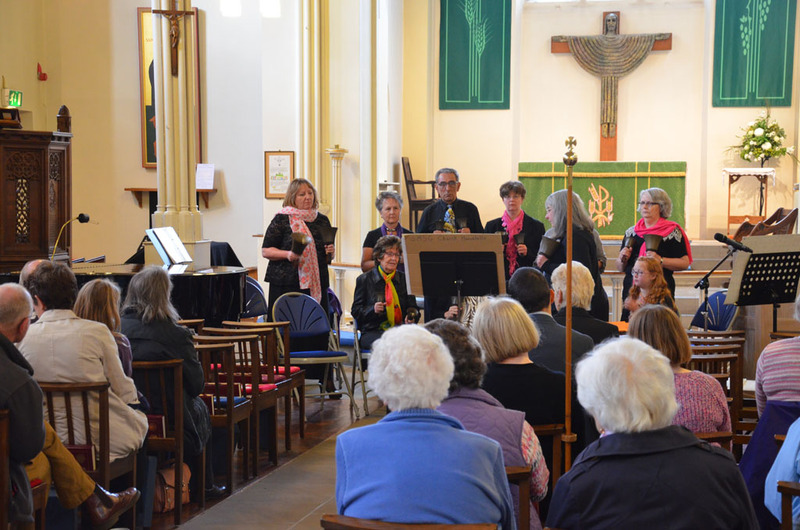 After expenses this concert raised £185.60 for the organ fund casework. 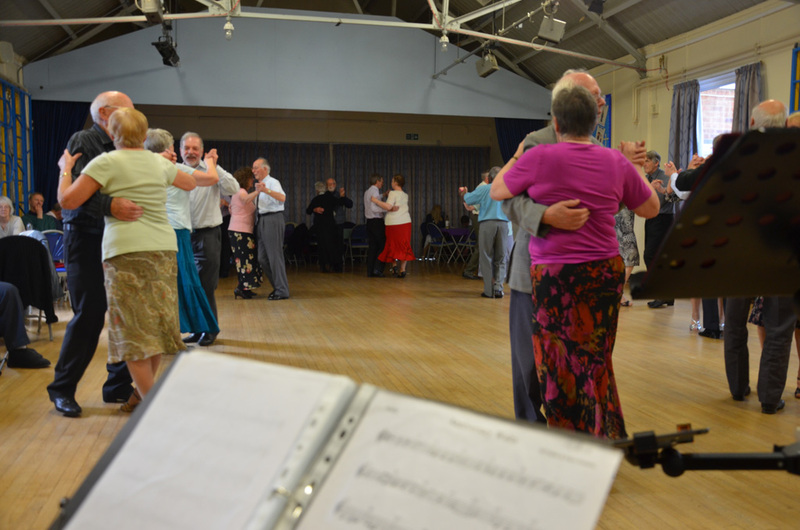 For several weeks SMSG Church band have prepared for the Tea Dance which took place on Sunday 19th April in the school hall. 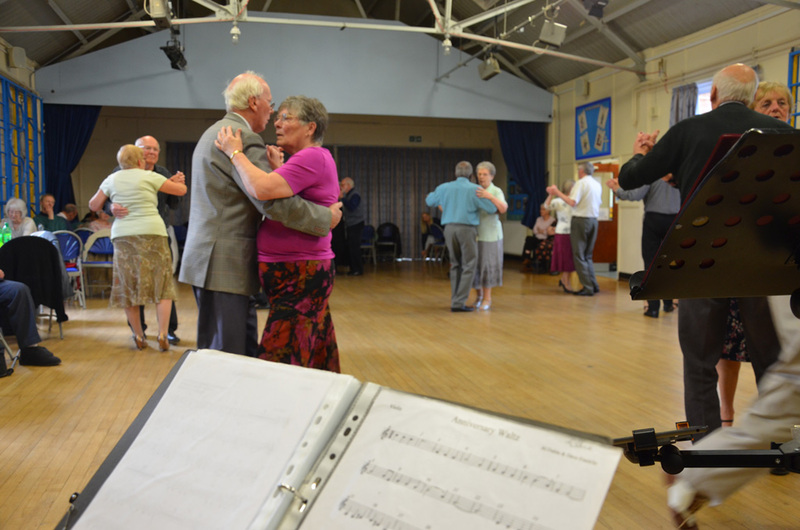 All the tables around the dance floor were filled with keen dancers waiting for the music to begin and we struck up the band shortly after 3:00 pm with a programme of dances set to some of our favourite pieces of music. 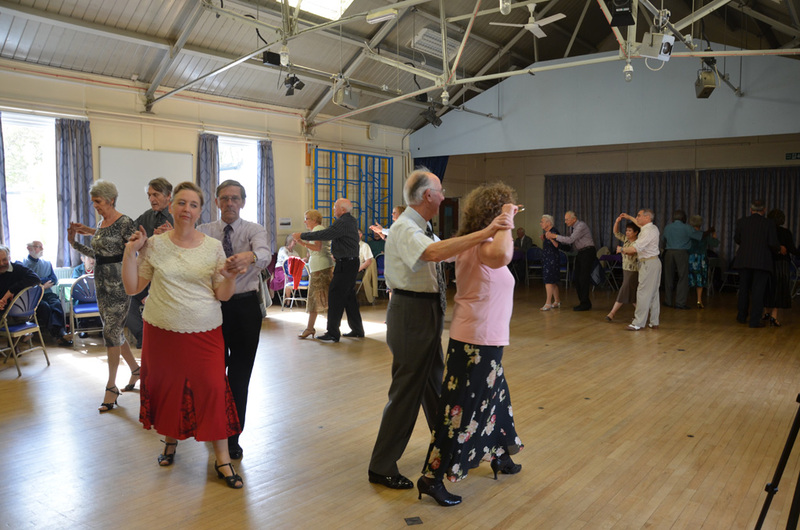 There was an interval with delicious home baked savoury and sweet refreshments, the very popular raffle and more dances. 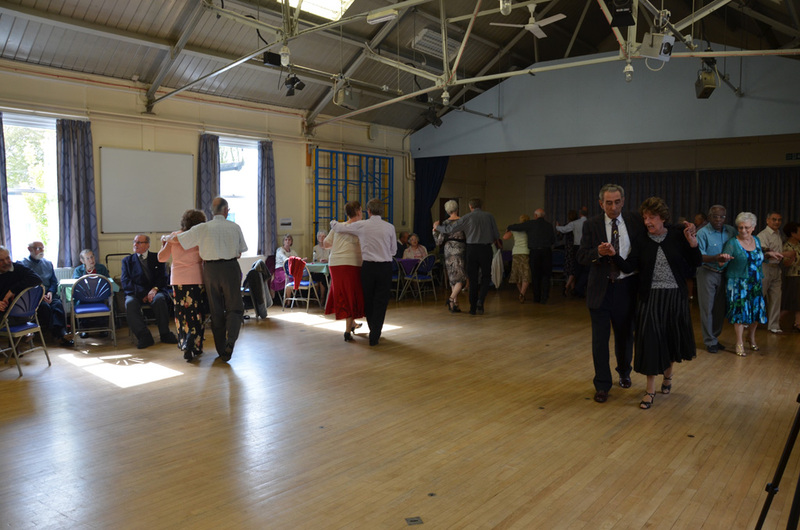 We raised a magnificent £294 for the organ fund from this event – special thanks to Lesley for organising it and for all the food, to everyone who helped serve refreshments, to the band for playing and everyone who came to enjoy themselves, it was a fun afternoon.